What began as a simple home project has turned into a thriving woodworking business in Beverly, Massachusetts. Jeremy Puz ’09 built a shelf out of discarded pallet board for his wife, Nicole, and discovered the unique potential that pallet wood could bring to furniture. 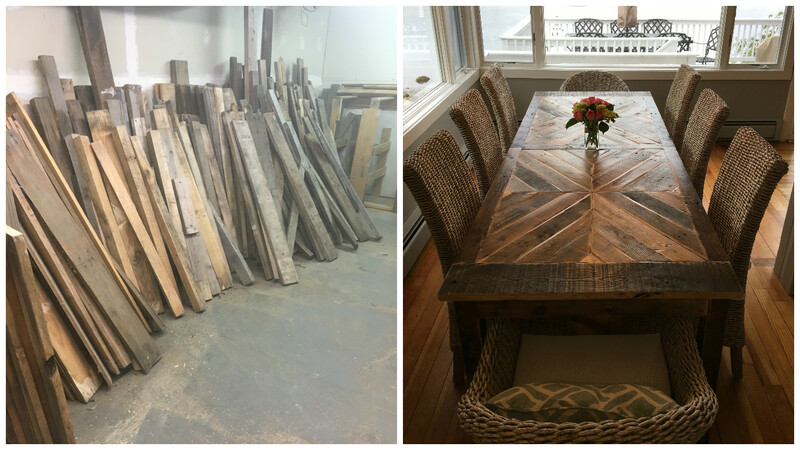 Taking advantage of the growing interest in rustic homemade furniture, he launched the multiyear creative process for what is now a business called Ingrained. After finishing the pallet shelf, Puz set up shop in the basement of his apartment and began to construct benches in his spare time. When a fair in Salisbury, Massachusetts, invited local artisans to advertise, buy and sell their products, he jumped on the opportunity. The positive response inspired him to start a furniture side business in 2013 alongside his already full-time landscaping business. A serial entrepreneur, Puz had started the landscaping business during his junior and senior years at Gordon to help relieve college expenses. The project took flight and he was soon serving several clients throughout the North Shore. Puz soon found that there was a ripe market for custom tables. At the same time, The Castle, a board game café in Beverly was beginning to take off. Owners (and fellow Gordon alumni) Kevin and Ryn Grant ’10 asked him to create his signature rustic tables for their new venture. From custom designs to wedding and special event rentals, business at Ingrained is thriving. But Puz said the success didn’t happen overnight. In fact, it was the hard times that brought him to where he is today. “At Gordon I had to pay for all my tuition, books and meals,” he said. “During the first month I hurt my back pretty bad while trying out for lacrosse. God brought me to a place of brokenness and it was a humbling time. However, when my back healed, I got a job at an estate in Manchester-by-the-Sea, Massachusetts, and my landscaping business came from a broken situation.